Time is running out on finalizing a Brexit deal, 122 days until the UK leaves the EU and the transition period begins, but the forex market is still pricing in soft exit as GBP/USD is still holding the October low at 1.2700. Earlier in London, cable broke below the 1.2800 handle as PM May begins her uphill battle to win votes over. The Times noted that Brexiteers will back May’s deal if she gives a resignation date, this however is not likely to occur. Parliament is widely expected to vote down PM May’s deal on December 11th, but that will not stop the Prime Minister from launching a campaign to convince skeptical politicians. May will need 320 votes from the 650-seat House of Commons to ratify the Brexit deal, but current projections according to the Guardian have her with only 230 votes of support and 409 against the final deal. If the Prime Minister loses the meaningful vote by a close margin, we could see a limited market reaction, as expectations will shift to the belief that a plan B could be put together. The market is currently pricing in for this vote to fail on December 11th. A strong defeat could ultimately lead to the threshold being reached for the confidence vote against Ms. May. A leadership challenge is triggered if 48 Conservatives write letters to trigger a vote of no confidence in May. Two weeks ago, the chairman of the party’s so-called 1922 committee, Graham Brady noted that he did not receive 48 MPs’ letters. 22 party members have publicly stated they submitted letters and it is believed another 15 have submitted their letters discreetly, but the exact total is not known. Even if we do see a confidence vote, the Prime Minister could keep her seat as there is no clear obvious replacement or political party with a better Brexit plan/strategy. If this agreement or a revised version is unable to get done, it is possible that the government may abandon talks and focus on getting a no-deal Brexit. A no-deal scenario could see sterling fall 5-10% against the greenback. Price action on the GBP/USD weekly chart highlights the current 3-week slide is tentatively respecting the 1.2700 handle. If we see another wave of selling, the next key support level is the August 15th low of 1.2661, followed by the 1.2600 level. 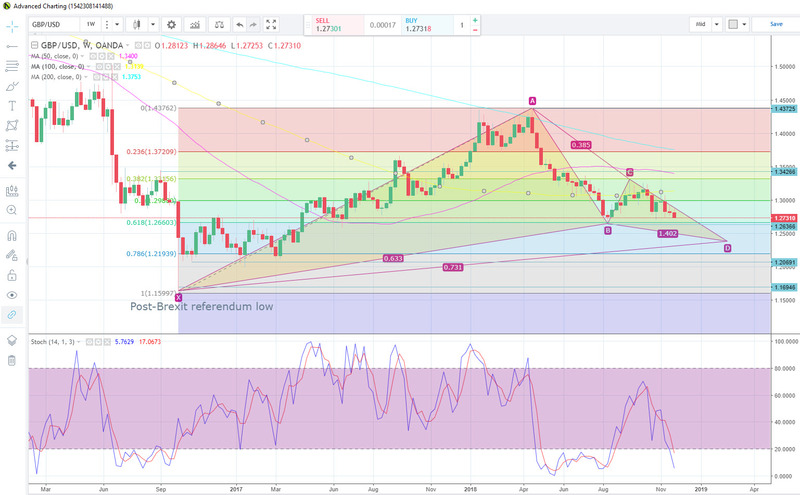 If we see cable in freefall the next major support level could come from a bullish Gartley pattern at around the 1.2400 region. To the upside, 1.2850 is key resistance.